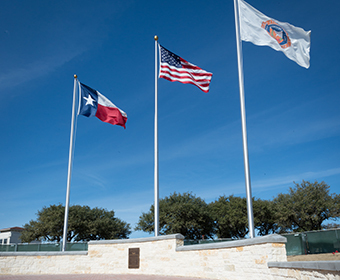 The Roadrunner Memorial Garden is a place where the UTSA community can reflect on those who have passed away. (March 15, 2019) -- The UTSA community will pay respects to UTSA students, faculty, staff and alumni who passed away in 2018 at the 11th annual Roadrunner Remembrance. The ceremony takes place at 3 p.m. on Friday, March 22 in the Student Union Retama Auditorium (SU 2.02.02). The university will also honor two individuals who have been great champions for UTSA – Tom C. Frost and Edith McAllister. Roadrunner Remembrance will feature readings and music to honor the individuals’ contributions to UTSA. A feather is placed in a nest to symbolize and honor each Roadrunner’s legacy. A reception will immediately follow the ceremony at the Memorial Garden where a symbolic feather wreath will be placed. Families that want to commemorate the time their loved one was at UTSA are encouraged to purchase a brick to be included on the Paseo. The Pave the Paseo project, a brick pathway along the Student Union Paseo, features bricks engraved with names and organizations.